I was at our winter retreat in Ft. Myers, Florida, enjoying almost 12 inches of rain in the month of January, a record, so I was not at the January MCG meeting. 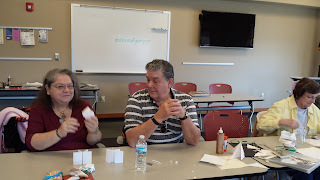 Sharon Esmont took over the reigns and I learned that there were a few new people who joined our meeting. When I returned for the February meeting, we counted a total of 19 people at the meeting. How exciting is that! The theme was to bring in your favorite hand and tool you like to work with and Angie West also did a demo on embossing of which she is a master. Our February meeting theme was to bring in a mock up of the hand you are working on which was given as a challenge assignment in 2015. I chose a very simple hand that I saw in a newsletter several years ago that intrigued me. I could do it in pencil, micron pen or even a pointed nib with varying results. Sometimes having a deadline for a project makes me get to the job at hand and not procrastinate. In April, we will see the finished results of the hand challenge. Barbara Fedder also did a great job in demonstrating watercolors on Yupo paper, which is like a piece of plastic, and then spritzing it with a very fine spray of alcohol. Thanks Barbara for the demo! I started collecting calligraphy, handmade books and watercolor books when I began my calligraphic journey in 1994. I also subscribed to Bound and Lettered and Letter Arts Revue so I have lots of books to peruse. The bookshelves I was putting them on were small and I had two layers of books some of which I couldn’t find when I needed one. So my husband went to his favorite place, Menards, and bought a four-layer shelf and I spent my weekend organizing my books so that I can find them more readily. What a difference! Now I need to start weeding out the magazines and pull out the pages I think I might need when I am 90 or so and then have some room for more! March brought a demo, by Anna Schlemma and me, of pointed pen and what you can do with this very tiny nib. I have always enjoyed copperplate and took a couple of Spencerian online workshops with Harvest Crittenden and one with Pat Blair, the White House calligrapher, so the pointed nib is very familiar to me. It seems that the request for copperplate on wedding invitation envelopes has grown in popularity especially for the more formal weddings. Anna is the “Akim/Rosie” queen and used her pointed nibs to demo a hand she uses frequently in her many books that she creates. We also had several members show the hand that they taught themselves. Good job ladies! “Don’t compare your beginning to someone’s middle”. So true every time we take a workshop and want to compare ourselves the first day to what the instructor has been doing for decades. You’ll get there with persistence and practice. 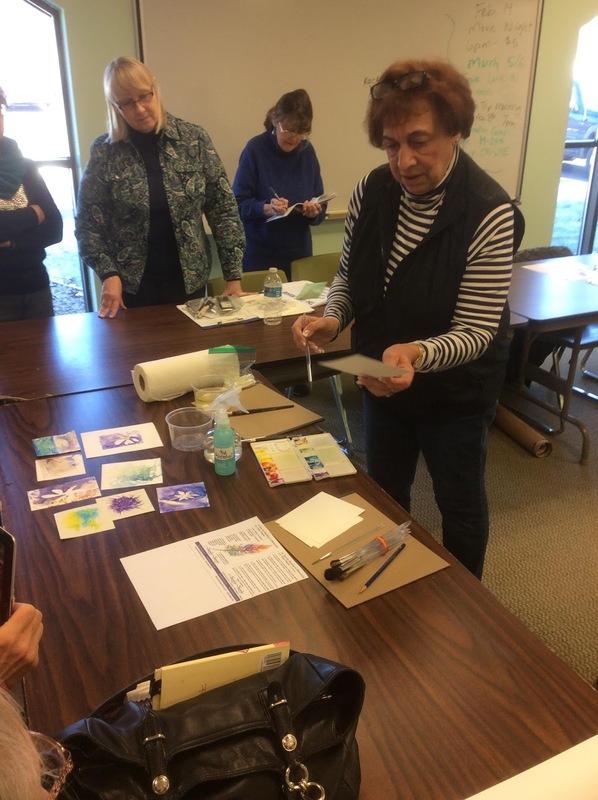 Maureen Trubac collaborated with the Francis Branch Library in South Bend for a book making demonstration in which we were to have 20 people signed up to make the little books. 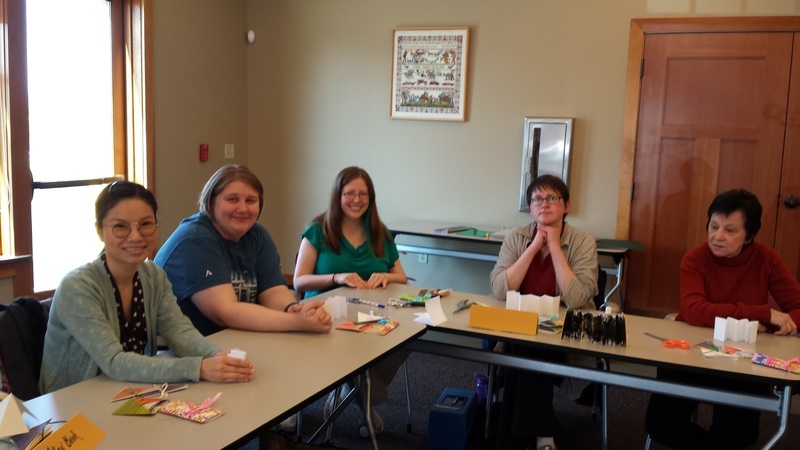 Saturday, March 26, was a busy weekend for everyone, but not only did 20 people come to the demo, but 5 walked in to make books. Luckily we had enough supplies to accommodate everyone, even though Maureen had to cut more paper to demo one extra book. The teo hours went by rapidly with Maureen, Ginny, Barbara Fedder, and Sharon Esmont hopping from table to table making sure everyone was on the same page. 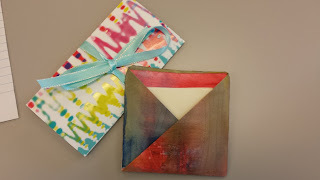 We helped everyone make a star book, and envelope book and two different accordion books. We all really enjoyed the people who came to the demo, but we also were able to interest several people in coming to our meetings and start their calligraphic and art life. Thanks Maureen for putting this together and hopefully we can do it again soon! Looking forward to three workshops this month! Julie Wildman in Mishawaka and Kristen Doty in Kalamazoo for two workshops back to back. Anna Schlemma, Maureen Trubac and Barbara Fedder will also be in Kalamazoo for one or both workshops. Pat and Angie West will be headed to Michigan for three days with Yves Laterme of Belgium. We hope to show and tell new and exciting work we have experienced in the coming months. Julie Wildman from Highland, Indiana will be in South Bend for a spring workshop entitled "What's Next, Taking your Art to the Next Level". The workshop will be held on Saturday April 2 and Sunday April 3, 2016 at Whispering Pines Community Room in Mishawaka from 9-5 on both days. The cost of the workshop will be $100. With supplies included. Julie has been with is before and is a very patient and giving instructor. Our workshops seem to have people sign up and then decide not to attend. We have been very generous in returning monies paid for the workshop if someone decides not to attend at the last minute, but we are going to have a change in this policy. There will be a nominal fee if you drop out of the workshop. If there would be an emergency, for instance, a birth of a child or grandchild, illness, etc., then the board will take this under advisement to decide on a course of action regarding a refund. Also, if the workshop is filled and there is someone to take your place, that would also qualify for a refund. So please, if your want to sign up for the workshop, make sure that you out that date on your calendar as a commitment. We have a small calligraphy group and we struggle to fill workshops at times. We need all of you to attend as many as possible so that we can continue to have quality instructors. If so, look up your favorite calligraphers because they are on facebook also. I like to look at Barbara Close, Reggie Ezell, Julian Waters,John Stevens, Rachel Yallop, Pendragons, Capital City Scribes, Yukimi Annand, etc. There is a lot of beautiful calligraphy on these pages that will get you inspired Also look at Joanne Fink and Barbara Lever's Facebook page. And then there is always Pinterest. Oh, my so many places to be inspired! PO Box in South Bend- Due to a lack of much mail at our Post Office box in South Bend, we have suspended any mail sent to that address. If you have anything to send to the MCG, please send to Maureen Trubac 50685 Mercury Drive, Granger, IN 46530 or Ginny VanderHey 51854 Stoney Creek Drive, Elkhart, IN 46514. When monies are due for a workshop or dues, they will now go to one of these addresses. American Frame - Just a reminder that if you order from American Frame, please mention MCG, and they will give us a small stipend. April 9 - Taking the South Shore to Chicago to see the Chicago Calligraphy Collective at the Newberry Library. Please let Ginny know if you are interested in going so we can all meet at the train station. 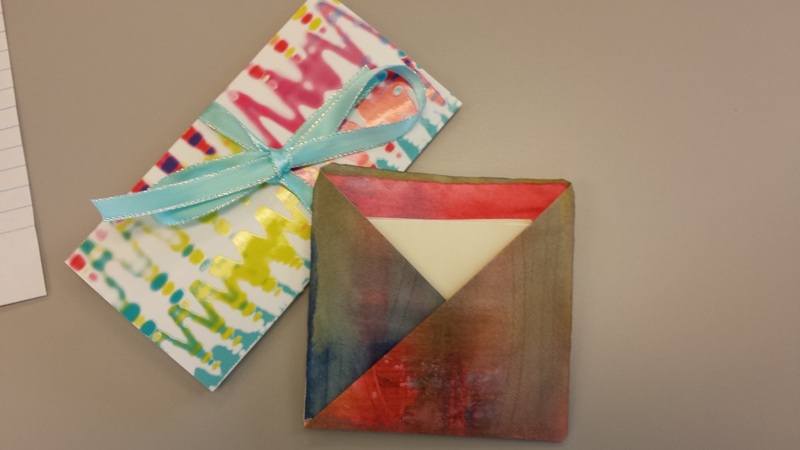 May 7 - Julie Wildman Workshop Show and Tell. Annual dues of $15 are due at the July meeting. Our annual dues have not changed in many years and are put to good use for supplies and make it/take it meetings, annual raffle in August, and, at the end of the year, we give to local charities. Please remember to bring your dues to the July meeting.